The raging war against eczema started way back when she was a wee baby. The symptoms were all there. 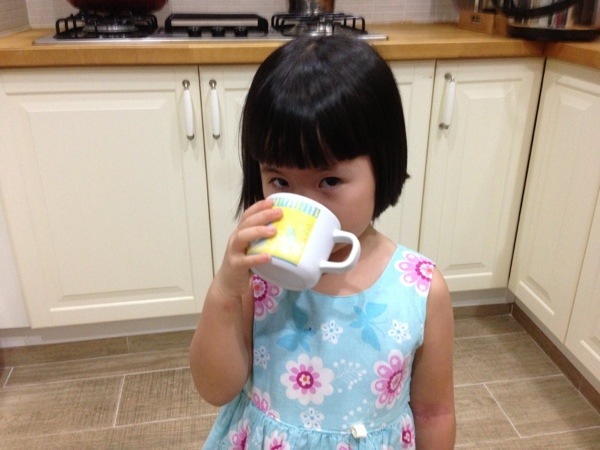 At 6 months old, due to my dwindling breast milk supply, I started her on formula milk. Her over reactive immune system triggered an instant reaction of severe hives on every single part of her skin, that included her face. Panicked, we rushed her to the hospital’s a&e. It went away with the administering of anti histamine. That’s the first sign of her brush with allergy. She was on and off allergic to various food. Luckily I was diligent on the 3 day food introduction exercise and managed to identify the cause. 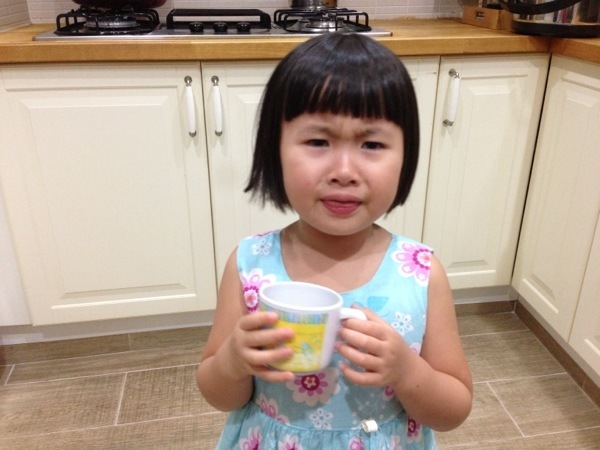 She was on an unprocessed, no condiment food diet until 3 years old. Fortunately she was an easy going child who loves food. 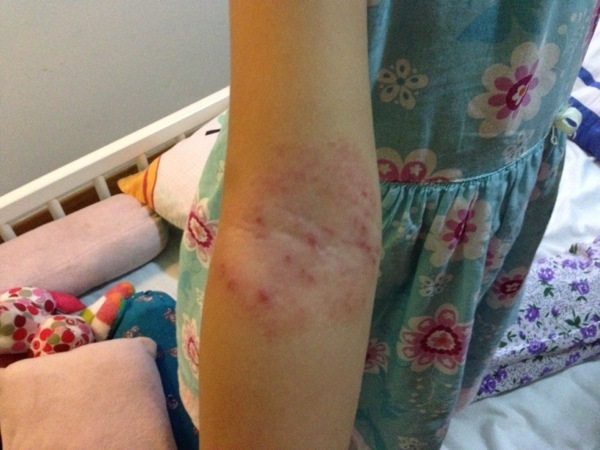 Her relationship with atopic eczema started when she was 8 months old. Berries triggered a mild reaction which quickly ceased when she stopped the intake and with external application of the Sebamed baby cream, religiously, every 2 hours. Whenever she had a flare up, the sebamed baby cream ritual started. It all went well and suddenly, one fine day, it stopped working. No matter how much and how frequently we applied the cream, the redness spread. We switched to the California Baby Calendula Baby Cream. It ko-ed the eczema. We had a 1.5 years relationship with the CB calendula cream until it stopped working as well. I switched to the Weleda Calendula Ointment. It pushed the eczema wave back a little, the redness spread, pushed it back a little and then it came back. It went on like a daily tidal cycle. It started from the right crook, then the left crook, her right wrist, right elbow, the back of her left knee, her neck. She itched, she scratched and she cried. I would start applying cream on the areas without open wounds then the 2 crooks would be the last to be treated. After I massaged cream into her left arm crook, she would chant,”not pain not pain”, although tears started to well in her eyes. She’d bent her arm so that she could resist scratching. After the application on her right crook, she would bend her arm and whimper, “Mama please hug me…” I’d hug the poor girl who still had both arms bent. She’s my brave little soldier. The external application seemed to be helping but it wasn’t good enough. It seemed like a never ending battle, back and forth, every day. I decided to bring her to the TCM. He’s a renowned TCM who used to be a Professor at our local university. He prescribed some medicine for her at a reduced dosage for her age. It looked brown and unappetizing. And he recommended her diet to be free of prawns and shellfish. She agreed and henceforth, whenever she is offered the taboo food (even when I am not with her), she will politely reject it. It took 30 mins just for her to down a few ml of brown medicine, amidst lots of coaxing, coercion, intermittent licks of honey. And I had to administer it to her twice a day!!! It was just too much a mental stress for me! I seeked help on Facebook. Ah! It’s a useful thing. Many people left me messages on various medication, alkaline water etc. Thank you to all these kind souls out there! I’ve written down everything and I’m going to try them all one-by-one. 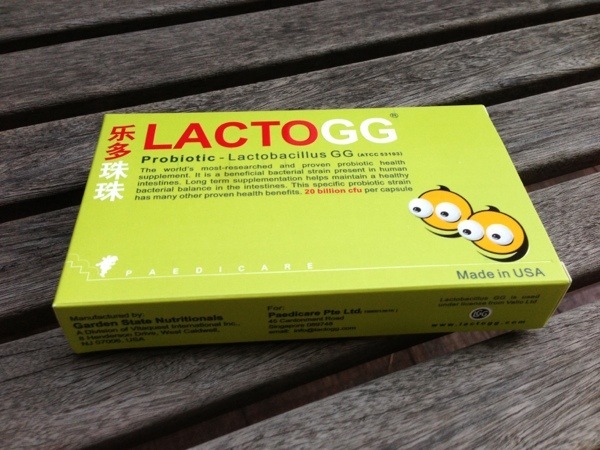 LactoGG is a probiotic. It is a special, unique good bacterium, which has been proven to promote health in the human being. Well, in short, it is an army of good guys introduced into your body to fight the bad guys! She’s had it for about 1 month. The patch on her wrist looks somewhat better. The patches on her arm crooks too. But they still have a long way to go to being totally gone. I’m still administering the Chinese medicine to her, when both of us are in good moods. I may change her external application cream when it runs out, to another one on my list to see if it can help push the tidal wave back. I’m determined to win this eczema war with her! Eczema, we will triumph over you!! May I know if your daughter is still taking the lactogg and if you’ve seen any further improvements? My 6 month old has eczema too and I,m desperate for a solution. Thank you. Yes she’s still taking it. She actually got a lot better taking the lactogg and using calendula cream. But the eczema is food triggered. It still comes back when she takes certain food. Glad that you are not using steroid creams to treat her eczema. Eczema is most likely allergen induced. It should go away or be under control once the allergen is determined and removed, be it diet, environment or chemicals. Remember that steroid creams will worsen the eczema, and the longterm effects of steroid use is horrific compared to eczema. Do visit this website to know more about topical steroid addiction. Thanks! Keeping her totally away from steroids. My 8mth old baby is suffering from eczema too. It hurts her physically and me emotionally . Tried everything as her skin everywhere was dry and rough to the touch, and would flare red at times and some patches of white. I have tried tons of medicine and by far, and tried steroid creams for a week until i learnt it will thin my baby’s skin!! Went to KKH after an allergic rxn with Heinz cereal, discovered she is allergic to eggs n nuts. And some additives i don’t know of, so homemade foods are best. Currently i am using Moogoo balm for irritated skin and Moogoo bath. Alkaline/filtered water in a 1L glass bottle with 1 drop of Young Living lemon oil, Young Living TenderTush ointment for her nappy area and super dry skin anywhere else. These have kept her eczema at bay. No flareups. I have just recently started administering lactogg to her milk, and also switched her similac formula to Karihome goats milk(so expensive!!). All with the hope of putting this eczema to an end. I need to wash her toys every few days and bedding as she is allergic to dustmites too. Discovered this after separate hives reaction episode. May our babies be free of this as of course we parents are hurt too when they are uncomfortable. And we try everything out there in the market to cure them of this itch. Do get an allergy test for ur cutiepie.. and always go natural! All the best..
May our babies be free of this as of course we parents are hurt too when they are uncomfortable. And we try everything out there in the market to cure them of this itch. All the best.. Yes! Did you take her off steroids? Looking forward to the day that all our children are free from eczema!! Hi, may i know where to get LactoGG? Are you still continuing using it for your kid? Yes. She’s still eating them. If you are in Singapore you can get them at unity and some organic shops like four seasons. I have seen the pharmacy at Kkh selling it too. But not all places sell it chilled. It’s best kept at around 24°C. Hi. If I’m in the States, can I get LactoGG too? If not, what’s the alternate brand I can try? Hi Dawn you can try culturelle. It contains the same strain as Lactogg. You can get it from iherb. But each capsule has only half the quantity of each Lactogg capsule. So you have to take 2 capsules of culturelle to get 1 capsule Lactogg worth of probiotics. When my daughter was flaring very badly she was taking 3-4 Lactogg capsules a day. Now she only has a little flare so she’s on 1-2 capsules a day. Nowadays if she doesn’t have a rash, I’ll not let her take. If your condition is serious you will need to take it for a few months to see improvement. It’s a natural remedy, not steroids. So it doesn’t work like a “miracle”. Be patient and you will see the effects.